The next day we visited Helvetinjärvi National Park, located in Ruovesi, about 45 minutes outside Tampere. Before trying to compare Scottish to Finnish National Parks it is worth taking a step back and looking at where they fit into worldwide protected areas. Both Scotland’s National Parks, Loch Lomond & The Trossachs and The Cairngorms are placed in Category V, Protected Landscapes whilst Helvetinjävi and Nuuksio National Parks (which we visited later in the week) are in Category II, National Park – see definitions below. Therefore, direct comparisons are problematic, but there are general comparisons that can be looked at. Our guide for the morning in Helvetinjärvi was Tiina, an upbeat and enthusiastic Finn, who ably answered all our questions and gave an excellent overview of some of the differences between Scottish and Finnish National Parks. In Finland the state owns the land classed as National Park unlike Scotland where there is only a tiny state land holding comprised of mainly buildings and car parks! 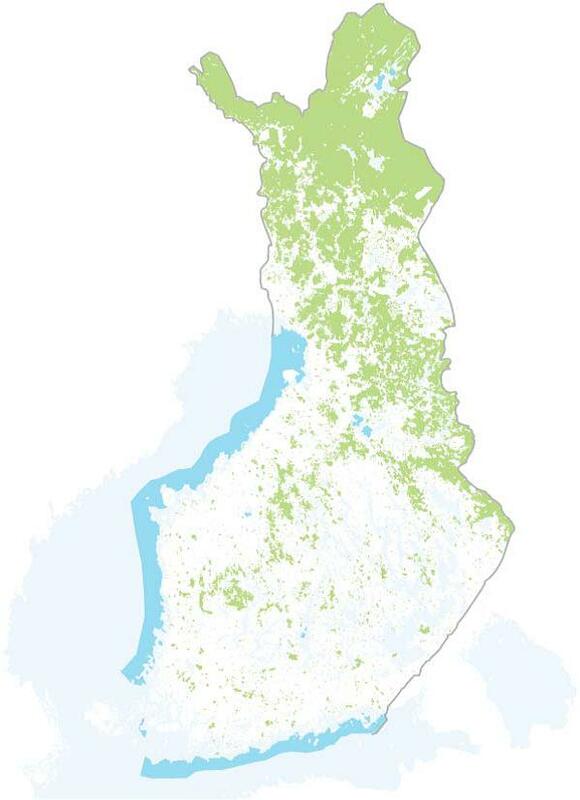 15,600 people live within LLTTNP, whereas the two Finnish parks visited have no permanent population. With land ownership comes the ability to control what happens within the Park’s boundaries. Most of the Everyman’s Rights (see Sunday section) apply, but restrictions are placed on where you can camp, have fires and in the case of Helvetinjävi National Park, where you can rock climb. Although there are big differences in how national parks operate in both countries there are similarities in the aims and methods of visitor management operations. We learned at Helvetinjävi that although there is freedom of access, there are subtle ways for protecting the fragile areas from visitor pressure; for example by putting in a path network in the less sensitive areas – most people prefer to stick to the path; this is a tried and tested method in many parts of the world for steering the public away from sensitive sites. There is a push in Finland to encourage people to get out and enjoy the national parks for health purposes. 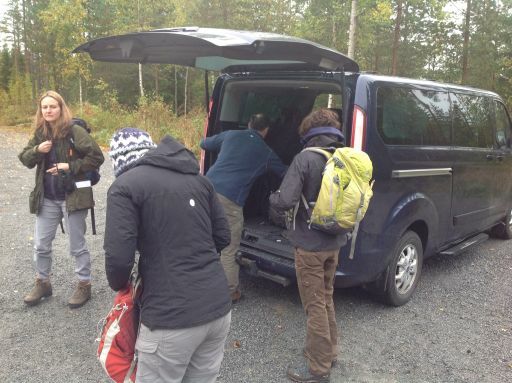 The aim is to persuade Finns that getting out and walking in their national parks will be good for their health and wellbeing; walking in general and in forests in particular is supposed to reduce stress levels, along the lines of the Japanese “forest bathing” concept. There are similar initiatives in this country, for example LLTTNP host a Health Walks Co-ordinator post and have volunteers who lead on health walks in and around the national park. These aim to gradually improve people’s fitness by making it easy to take part in walks and boost confidence enough so hopefully the participants will take walks on their own and explore new areas. There were a couple of items discussed that we could certainly learn from. The use of walks on the uneven path surfaces to improve the co-ordination of children and the older population with dementia. I have read about the former or at least the move towards providing uneven surfaces (including steps) in children’s play areas to allow children to develop necessary motor skills rather than engineering out risk. So, it’s a great idea just to use what you have already got i.e. the path network plus there are associated benefits of being out in the forest. The idea around path systems being used to stimulate older peoples’ brain to help prevent or slow dementia is interesting, as with children, it revolves around the need to think about where you place your feet – it is something that should be considered in this country too. Helvetinjävi National Park has an innovative scheme working in conjunction with the prison service. A group of prisoners work a five day week in the park under leadership of a Park Ranger. They do such tasks as chopping fire wood for the fire sites, emptying the long drop toilets and other maintenance tasks. Many of the prisoners come from difficult back grounds and have not had a proper working life before, so to be able to be outdoors and have a structured and productive working environment proves useful to them on release. The prisoners have to apply for the jobs and they are much sought after. Again it is something that should be looked into here for making a contribution to rehabilitating offenders in our prisons and being more inclusive in general. In the afternoon we visited Seitseminen national park where Tiina introduced our group to Metsähallitus. 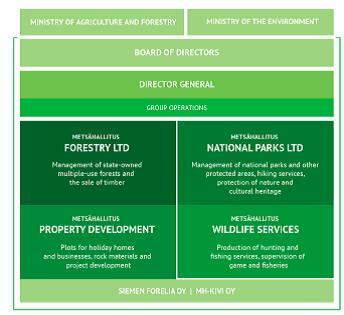 Metsähallitus (Finnish), Forststyrelsen (Swedish), “Administration of Forests,” is a state-owned enterprise in Finland. It is responsible for the management of one third of Finland’s land area. Its objectives are to use and develop these state-owned land and water areas responsibly, in a way that maximises their benefits to society as a whole. The reconciliation of various functions and ecological, financial, social and cultural sustainability lies at the core of its operating principles. It contributes € 96 M to the Finnish state, through a turnover of € 330 M and employs around 1 400 person/year. It is a significant employer in northern and eastern Finland. Metsähallitus manages 9,121,000 hectares of land and 3,417,000 hectares of waters, totalling 12,538,000 hectares. The different management is shown in Figure 3. Generates most of Metsähallitus’ revenue. Develops the wind power business. Ensures the sustainability of game and fish populations and sells hunting and fishing licenses. Park and Wildlife manage a Protected Areas system consisting of 1.7 million hectares of statutory areas and roughly 1.5 million hectares of wilderness areas under management. Nature reserves, wilderness areas and hiking areas established on state-owned lands are the central parts of the protected area system in Finland. Almost all of these are included in the European Union’s network of Natura 2000 areas. Privately-owned protected lands further expand on the state-owned network of protected areas. National hiking areas are established in accordance to the “Outdoor Recreation Act” (ulkoilulaki) on state land in different parts of Finland. 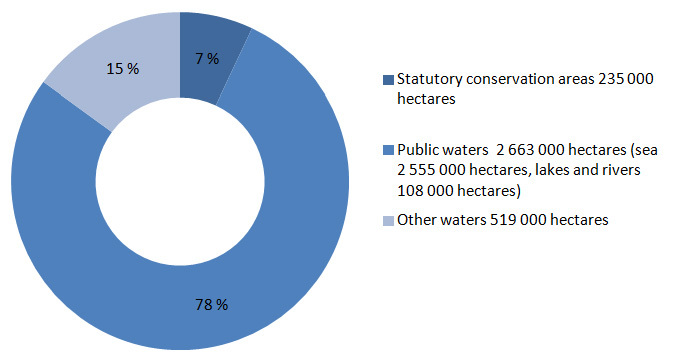 Most protected areas are situated on state-owned land. State-owned protected areas are managed by Metsähallitus, Parks & Wildlife Finland. Management and supervision ensure sustainable hunting and fishing. To do this 56 000 hunting licences are sold, 81 000 fishing licences sold and 380 hectares of restored game habitats. State-owned forests and waters across Finland offer good opportunities for recreation and a wide range of activities. The ““Everyman’s rights” in Finland are extensive. However, some activities require a permit or permission. In many ways the structures and objectives of Metsähallitus are similar to those of the Forestry Commission, Scottish Natural Heritage and National Park Authorities. Metsähallitus offers a more unified approach, a single organisation with four operational groups. Its relationship with Government and Parliament is similar to that operated in Scotland. What is clearly different is the funding. Metsähallitus are able to operate to provide a significant income (€96M in 2016) to the Finnish state, this compare to Scottish Government grant in aid of some £120M for FCS, SNH and NP bodies. Significantly Metsähallitus is able to general significant revenue from timber production on state land. Scale is a significant factor, Metsähallitus manage ca 3 400 00 ha of productive woodland, whereas in Scotland Forest Enterprise manage ca 450 000 ha. In Finland timber production on private land is also achieved without significant les state-intervention than in Scotland. A more detailed analysis behind these revenue differences is beyond the scope of this report. Metsähallitus is able to fund its Wildlife Service (Suomen Riistakeskus) which employs ca 70 staff, through a game management fee (33 €/year). Hunting is part of Finnish culture and large numbers of individuals hunt, 330 000 in 2016, Foreign hunters must also get a Finnish hunting card and pay the game management fee before hunting. Hunter must also pay fees for animals killed, but also collect the basic fieldwork which allow the Wildlife Service to undertake scientific research about game and fish, annual estimations about the quantity and quality of the game species, which leads to basic information for hunting plans and licences. Later in the afternoon, after our introduction to the activities of Metsähallitus, we explored Seitseminen National Park under the guidance of Tiina. The visitors’ centre offered artistic interpretations of the nature and wildlife found in the forest. We also experienced how crofters used to make their living in these remote backwoods at the heritage farm at Kovero. This featured a costumed actor and recreations of artisan life, including weaving and food preparation.